Spartan helmet on display in the Olympia Archaeological Museum, Peloponnese – Greece. One can almost make out the inscription. Almost. And he’s dead right. 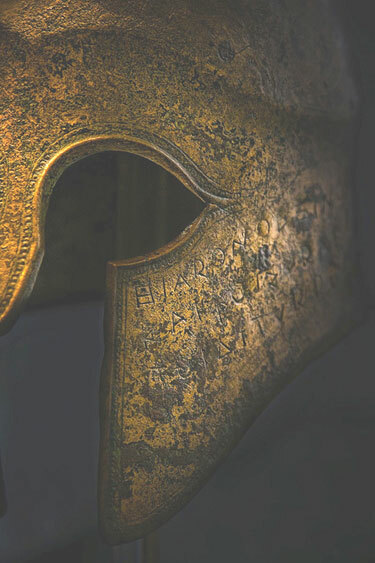 This is the helmet of Miltiades, the same Miltiades who devised the strategy that won the Battle of Marathon. 4 Feedbacks on "Spartan Helmet (Detail)"
‘Sparta’, along the eye opening, and, ‘Miltiades dedicates to Zeus’ along the bottom? I wish I had your eyesight. Thanks. While it is true I am quite near to 60 in age yet do not wear glasses, it is not that. It is more that I have tasked myself to become ever more adept at sleuthing. Even so, notice the question mark in my comment. The best have been able to attain is, ‘I’m not completely sure’, at least not to the degree which is satisfying. How that comports with your, ‘almost’ is undecided. I’m sure now. Just follow my link, and you’ll see.